Starring: Bradley Cooper (Limitless), Dennis Quaid (The Day After Tomorrow), Jeremy Irons (Eragon) and more. Rated: Rated PG13 for language. It was the best of ideas, it was the worst of ideas. This multi-layered, semi non-linear story tells the tale of a struggling writer who, when an unbelievably well-written story unexpectedly falls into his lap, accepts the credit for someone else’s work and faces the consequences of the aftermath. 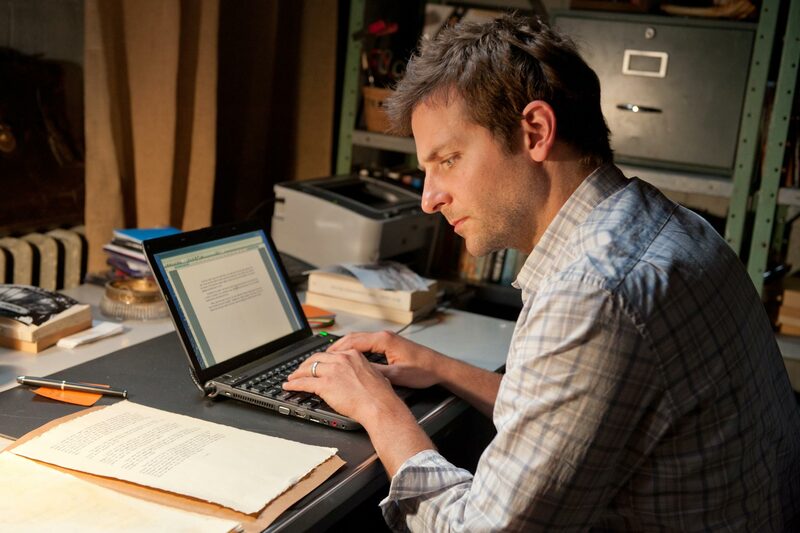 Bradley Cooper stars as the author who “penned” the words, however, the true author (Jeremy Irons) of the now-famous book finds him and shares the true story’s inspiration and the meaning behind those words that touched the lives of millions. While the movie would have sufficed with just focusing on the story of Irons’ character, the filmmakers felt the need to take the viewer on a rather confusing detour of, yet, ANOTHER writer’s life (Dennis Quaid) whose story seems to have very little connection at all. Some of the best ideas mixed with some of the worst as the distracting outer shells of the story interrupt the truly meaningful underlying themes and messages of “The Words.” (To avoid spoilers, there IS a way that the three stories do work together, but by the time that is realized it seems a bit preposterous and unnecessary). Dennis Quaid, Zoe Saldana, Olivia Wilde, J.K. Simmons and Ron Rifkin provide the support in debatable necessary roles as the intertwining stories translate from the script to the screen. One would think that with such an elaborate cast that “The Words” might be more than it actually is. Unfortunately, this layered story -verbose with unnecessary narration (2 different narrators throughout)- is a mixture of three stories with only one that really held any captivating meaning or merit…that being the original author’s tragic tale. At some points it is easy to tell what the movie is about, and at others it is not. Points to the film for being bold in attempting to make you think (something that several popcorn flicks avoid lately), but the film would easily have stood on its own without including the entire Dennis Quaid/Olivia Wilde storyline. The incorporation of this third layer of the story detracts from the beauty of the source to begin with. 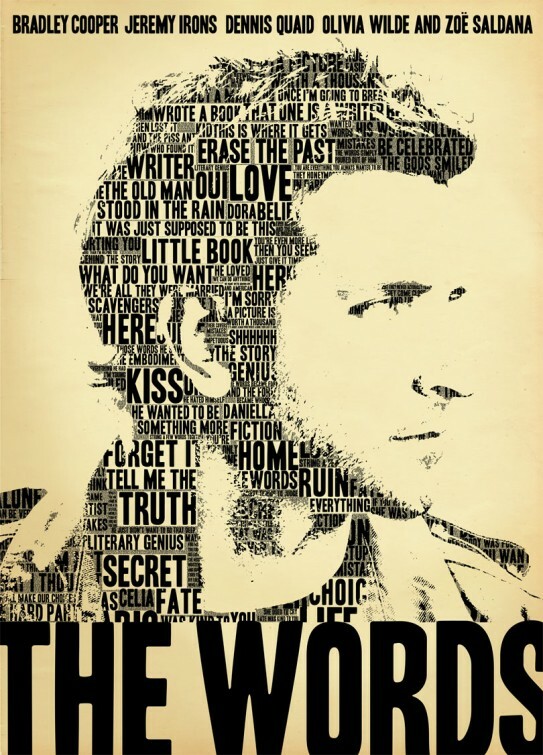 Yes, at its root “The Words” is an intriguing tale of people sharing similar experiences, passions, and desires. It contains some potent performances (primarily from Irons and Cooper) but is diluted by the first-time directors’ inability to blend all of the experiences together in a manner than bears any deeper meaning to audiences. A nice idea that got polluted with too many additional bad ones. It truly looks like it could have been excellent. 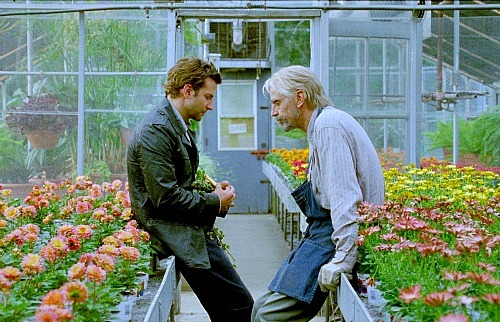 And what’s up with Bradley Cooper and writers? yeah, he seems to have an affinity towards that, doesn’t he? This could have been far better than it was. I’d advise to avoid it. Thanks for reading/commenting Alley! Are you seeing anything this weekend?